Mexico by AMResorts Take your pick of stunning hotels with sun-soaked beaches which boast a decadent array of features and facilities from á la carte restaurants to world class spas providing invigorating treatments. Savour all-inclusive luxury resorts with options for families and adults only to suit all traveller types. Dominican Republic & Jamaica by AMResorts With lavish resorts featuring Endless Privileges®, Unlimited-Luxury® and Unlimited-Fun®, including premium drinks, lively daytime activities and nightly entertainment, you can look forward to an exceptional holiday experience. 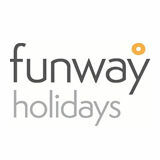 Holidays with Pride Funway Holidays is a big supporter of equality and diversity and wants to offer the right holiday to suit all their holidaymakers, no matter who they’re travelling with or what kind of holiday experience they’re looking for. We pride ourselves in working with hotels and resorts that are welcoming to all, as well as arranging holidays to destinations that have fantastic LGBT+ events and nightlife. So why not take part in a local Pride event for an even better holiday experience? 4* RIU PLAZA NEW YORK TIMES SQUARE The elegant, ultra-modern style Riu Plaza Times Square is located just a few steps from iconic Times Square. Join the world’s largest Pride in New York, with events running throughout June 2019. This trendy, stylish adults-only resort boasts ultra-contemporary suites with magnificent views, Unlimited-Luxury ® , and great non-stop entertainment. Visit for Playa Pride, which runs from 10 – 16 June 2019. Explore the SeaWorld Parks The wind in your hair, the sound of animals all around, the scent of adventure in the air… You plunge, you plummet, you splash, you scream.You are now at the heart of all the action at SeaWorld®, Aquatica®, Busch Gardens® and Discovery Cove®. Lose yourself on incredible wildlife-inspired thrill rides, enjoy a once-in-a-lifetime animal encounter or choose to simply float the day away. Adventure is calling. *Savings ‘up to’ valid on accommodation portion only. 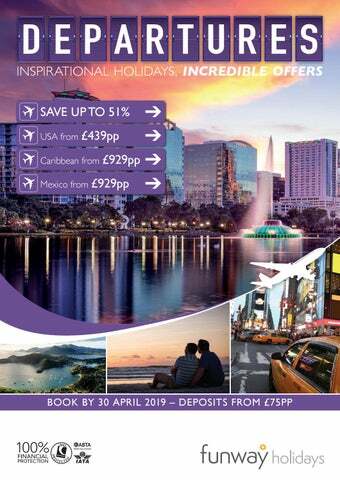 Offers valid on bookings made by 30 April 2019. All offers can be withdrawn at any time. All offers are subject to availability and change. Prices based on 2 adults & 2 children (under 12) sharing, accommodation is on a room only basis. We are 100% financially protected - ATOL: 2853 / ABTA: V000X/ IATA: 91273442 © 2019 SeaWorld Parks & Entertainment, Inc. All Rights Reserved. Disney Area Private Villas Our wide range of Orlando villas are the perfect choice for a fully flexible holiday, offering unbeatable value for money, all the homefrom-home comforts you would expect, plus the added freedom to come and go as you please. All our villas come with their own screened pool and lounging areas, ideal for relaxing and soaking up the Floridian sunshine. Villas range from 3 bedrooms which sleep up to 6 people, to 8-bedroom villa which sleep up to 16 people.